My trifecta of shorts on Friday finished with Fishin' For Tradition: The Lutefisk Saga directed by Madison native Eric Nelson who was on hand at the screening. If you're part of the vast majority of humankind that has never heard of lutefisk then know that it is whitefish (usually cod) that has been dried and reconstituted via a process that includes soaking it in lye. It's a Nordic dish though it's most commonly associated with Norwegians. Fishin' For Tradition opines that the origins of lutefisk lie in the Lofoten Islands of Norway. A fishing community, the catch was dried outside and treated with lye in preparation for export. Today in America, the Olsen Fish Company in Minneapolis is the largest supplier of lutefisk with the Midwestern states getting the vast majority of it. In the Madison area, Soderholm Foods distributes lutefisk to Sons of Norway lodges, churches, and other groups that serve the fish. 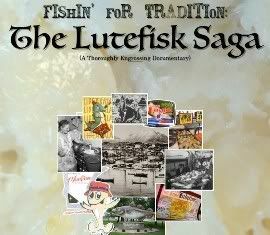 The movie takes the viewer to various locales where lutefisk is served and shows how it fits into the preservation of Norwegian traditions. At the Sons of Norway lodge here in Madison, members of the Edvard Grieg Chorus cook lutefisk while singing. Over in DeForest, people hunker down for a lutefisk dinner at a Lutheran church. Many of the diners are older folks who continue the traditions of their families by gathering with friends & family and eating lutefisk in the late autumn. Commentary is provided by UW-Madison folklorist Jim Leary and Patty Hager, a lecturer at the UW who teaches Norwegian. They echo the sentiments of the diners and note that lutefisk is associated with Christmas and childhood and is also a symbol of ethnic heritage. Indeed, during the Q&A after the screening, Eric Nelson revealed that he grew up in a Norwegian household and ate it. Now, with his family aging, he decided to make a movie that was a testament to them and their traditions. I tink I'll eat you anyway. Fishin' For Tradition also took us to Madison, Minnesota, the self-proclaimed Lutefisk Capital USA, for their annual lutefisk eating competition, where Jerry Osteraas defended his title. He remained champion after defeating several opponents, including a trio of brothers who looked absolutely disgusted after trying lutefisk for the first time. Look for a DVD release soon so, if you missed it at the festival, you too can enjoy this fun Nordic culinary saga.